Throughout his long and influential composing life Per Nørgård (b. 1932) has had an extensive relationship with the organ. On this recording the renowned organist Jens E. Christensen performs both The Organ Book, an evocative collection of shorter pieces suitable for use in church services, and the overwhelming Canon, a large-scale organ work characterized by its infinity series and golden rhythmic proportions. Preludio Féstivo 3:04 6,40 kr. 1. Look down, O Lord, from Heav’n behold 1:52 6,40 kr. 2. We now implore the Holy Ghost 2:58 6,40 kr. 3. I do desire dearly 2:58 6,40 kr. 4. On Thee alone, Lord Jesus Christ 1:51 6,40 kr. 5. Arisen is the holy Christ 3:54 6,40 kr. The year passing (chorale) 8:12 9,60 kr. Frost hymn music 3:58 6,40 kr. Winter hymn music 6:22 9,60 kr. The year 3:13 6,40 kr. Preludio & Corale Doloroso 2:33 6,40 kr. Arietta di Consolazione 2:45 6,40 kr. Christ rose up from the dead 3:03 6,40 kr. Summer Prelude 2:20 6,40 kr. An eternal paradise I know 2:32 6,40 kr. O blessed joy 1:40 6,40 kr. Toccata - “Libra” 4:50 6,40 kr. Throughout his long composing life Per Nørgård (b. 1932) has written music for more or less all instruments. The piano is probably the instrument that he is closest to, but in fact he has also had a very long relationship with the organ. It was on the advice of his teacher and mentor, the composer Vagn Holmboe, that Per Nørgård began studying the organ. He was just 17 years old when he became a private pupil of Holmboe in composition and theory, but more was needed, thought Holmboe, who sent Nørgård to lessons in ear training and organ playing. As a young man Per Nørgård was himself an organist in the Danish Church for a short period, standing in for his organ teacher Karl Johan Isaksen in the Sankt Jakob Church in Copenhagen. The church connection may come as something of a surprise to most listeners who know Nørgård’s music, for if there is one thing we do not associate with him, it is dogmatic schools of thought and established ideas. He has to a great extent created his own constantly developing philosophy in which science, astrology and cosmology from East and West, past and present, merge together in personal visions. Is the sacred music tradition important to you when you write organ music? – Without the tradition I would have felt firmly planted in thin air. A thousand years of notation: my terra firma! How do you see the function of music in the church service? – Since I’ve written melodies for several hymns – one of them “approved” – of course I see congregational singing as just as important as absolute music. Unfor­tunately I probably have a more ‘touristic’ relationship with ritual/liturgy. Should stylistic elements from contemporary composition music be incorporated in the music of the church service? – But yes, why ever not?! In 2015 Orgelbogen (The Organ Book) was released, a collection of Per Nørgård’s shorter organ pieces for use in church. The Organ Book is not an independent work, but a supplement to the publications of Nørgård’s larger organ compositions such as Canon (1971) and later pieces such as Trepartita (1988) and Mattinata (1992), both composed for the organist on this recording, Jens E. Christensen. Unlike Nørgård’s longer organ works, which are often virtuosic, The Organ Book features simpler pieces in sacred music genres like prelude, choral prelude and fantasia, suitable for use in church services. In many cases the music is directly related to melodies from the official hymnal Den Danske Salmebog (The Danish Hymn Book). But the pieces certainly belong to Nørgård’s unique universe, and in them we also meet the ‘infinity series’, his very own version of the serial composition technique. One of the freer pieces in Orgelbogen is this occasional work, written in 1956 when Nørgård’s friends Birgit and Hans Henriksen were to be married. The piece was given its first performance at the wedding in the Skt. Bendt Church, Ringsted, by Jørgen Ernst Hansen. The powerful festive wedding prelude plays melodically and harmoni­cally on the interference between the semitones in the chords, not least between major and minor thirds. Per Nørgård’s earliest organ work is the Five Organ Chorales composed in 1955. They were given their first performance the same year in Vanløse Church by Jørgen Berg. The five pieces are fantasias and variations on well-known melodies from The Danish Hymn Book. Nørgård has chosen some of the hymnal’s oldest melodies which came to Denmark from Germany along with Luther’s Reformation. Mig hjertelig nu længes (I do desire dearly) – melody by Hans Leo Hassler, 1601. As a pupil at the Copenhagen Boys’ Choir School Per Nørgård was brought up with the Protestant church and organ music, not least Johann Sebastian Bach’s organ chorales. The many layers in Bach’s music with different rhythms and tempo effects have remained a constant inspiration. As in Bach’s organ chorale Wachet auf ruft uns die Stimme, the melodies in Nørgård’s organ chorales are like core voices amidst a polyphony of contra-parts that flow along in other tempi. A collection of pieces from 1976-1980, all of which have their origin in the hymn Året (Som året går) (The Passing Year) with a text by Ole Sarvig. The starting point is Nørgård’s chorale melody (which was included in 2003 in The Danish Hymn Book. Per Nørgård and the editor of The ­Organ Book, Ivan Hansen, offer great freedom of choice in the performance of the pieces. Singers and instrumentalists can be used and, as here, one or more parts can be played alone. Arietta di consolazione – performed here in three variants. One of the oldest melodies in The Danish Hymn Book is the pre-Reformation Easter hymn Krist stod op af døde (Christ rose up from the dead). Nørgård wrote this little fantasia over the melody in 1976. The piece did not appear in his worklist and was in fact also forgotten by the composer himself until it was rediscovered on the transfer of his papers to the Royal Danish Library in 2013. A revised version of the choral fantasia was made in 2014. The small choral prelude combines the melody of the Easter hymn with simple infinity series and overtone harmonies. This piece from 1991 is the first part of the work A Summer Prelude and Two Seasonal Songs, where the songs have texts by Henrik Nordbrandt. Per Nørgård feels instinctively that all music consists of one line, and in the course of time infinite possibilities are created out of it – and so it is in this summery prelude where all the melodies are generated by the infinity series of the piece. Two choral fantasias written in 1992 and 1995 for Jens. E. Christensen. Jeg ved et evigt himmerig (An eternal paradise I know) is a melody from c. 1640, also known as Nu falmer skoven trindt om land (The forest fade all round the land). Den signede fryd (O blessed joy) was written on the basis of Weyse and Grundtvig’s majestic morning hymn Den signede dag med fryd vi ser (The blessed day with joy we see) from 1826. The choral fantasia was composed for the tricentenary of Our Saviour’s Church in Copenhagen in 1996 and is “dedicated to the memory of my mother” by Per Nørgård. The contra-parts in the choral fantasias surround the melodies chromatically and colour the piece with overtone harmonies. Per Nørgård has often re-used and re-composed his own music – in this case the Interlude (movement VIII) from Libra (1973) for choir and instruments. The piece was originally written for guitar, but in 2013 was transformed into an expanded organ version in collaboration with Ivan Hansen. This ostinato toccata plays subtly on reminiscences of Bach’s C Major Prelude from Das Wohltemperierte Klavier (I) and Ravel’s Bolero. The ‘Libra’ in question is the zodiac constellation. 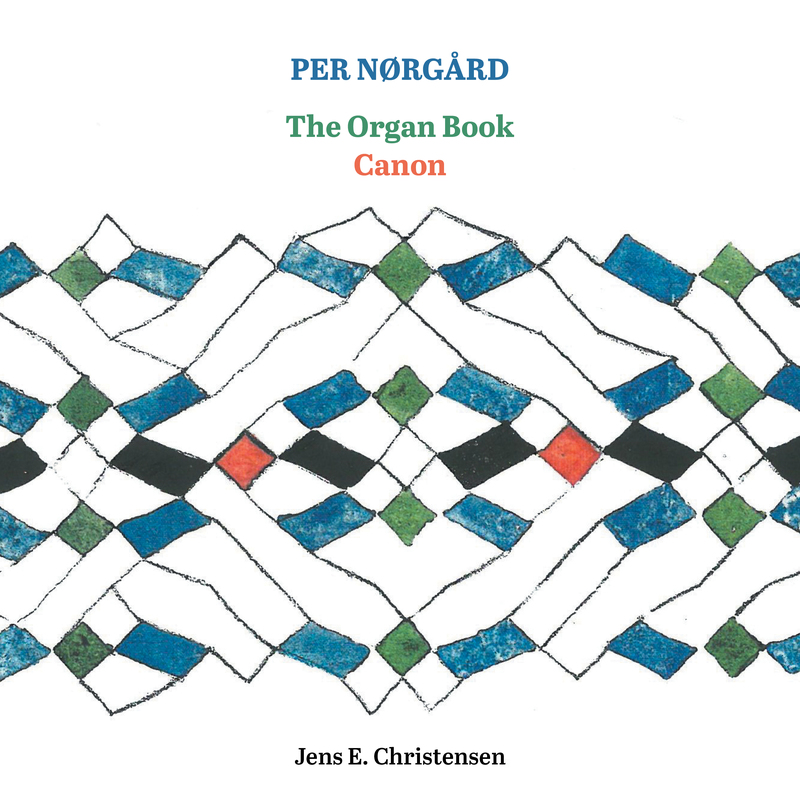 Canon is one of Nørgård’s largest independent organ works and is not included in Orgelbogen. It was composed in 1971 and given its first performance in the St. Paul Church in Aarhus by Jesper Jørgen Jensen after a great joint effort to put together a performance version. The difficulties are due not least to the ‘golden proportions’ of the rhythms. Canon consists of seven large parts, ‘cycles’, which are in turn divided into eight smaller ‘stages’. The piece begins as a ‘creation’, the second cycle is more motoric, the third inward-looking, the fourth grotesque, the fifth involves a contrast between day and night moods (forte and piano), leading on to an overwhelming breakthrough after which the piece takes its leave in the seventh cycle and returns to its starting point and the low F.
The same infinity series is used in all parts at different tempi. In each cycle the rhythm is classically periodic in the first stages, then becomes more ‘golden’ in its proportions in the middle stages, only to return to a traditional pulse again. It is very difficult to indicate the golden proportions with our traditional metric notation. In the golden rhythms the short note value relates to the long one as the long one relates to the sum of the two note values. To avoid misunderstandings it was necessary to publish a long preface to the work and two versions of score: a proportional version with indications of the subtly formed lines, and a metric version for detailed practice in sol-fa.